One of the most common expectations new users to Eloqua have is the ability to build a lead nurturing campaign. It’s a fair expectation and really is a pretty simple process. The hard work has more to do with the content, than the configuration of Eloqua and the Campaign Canvas. Assuming you have your content in place, the following are some tips for you to consider as you embark on your first lead nurturing campaign using Eloqua. The Eloqua Help Centre provides the most current and up to date information about Eloqua and its many functions. You’ll find a range of tips and ideas amongst the the Eloqua User Group webinar replays. More are added regularly. The answer to this question will determine your content more than it determines the nurturing experience. The principle behind nurturing is to provide consistent messaging around a key topic associated with specific calls to action. If you’re nurturing leads, you need to start at the Segment and determine what qualifies a person to enter your campaign or to become a campaign member. 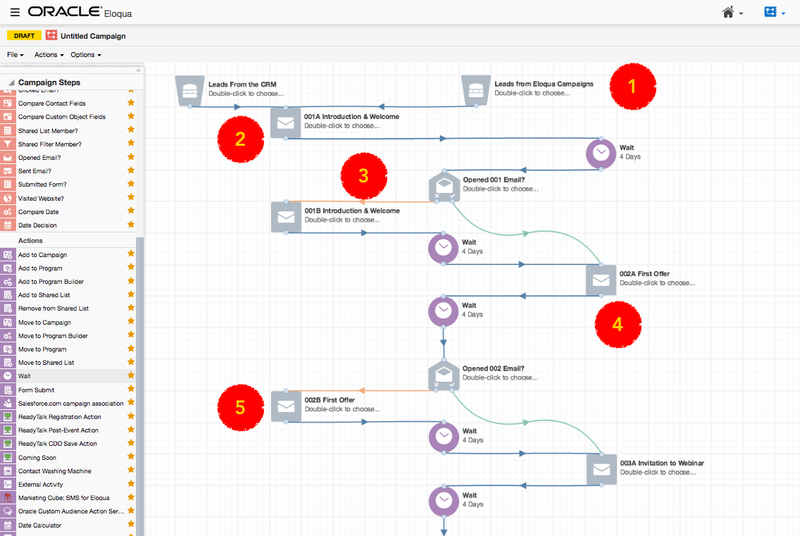 If your source of leads is the CRM, you’ll most likely have Eloqua connected to the Lead Object. 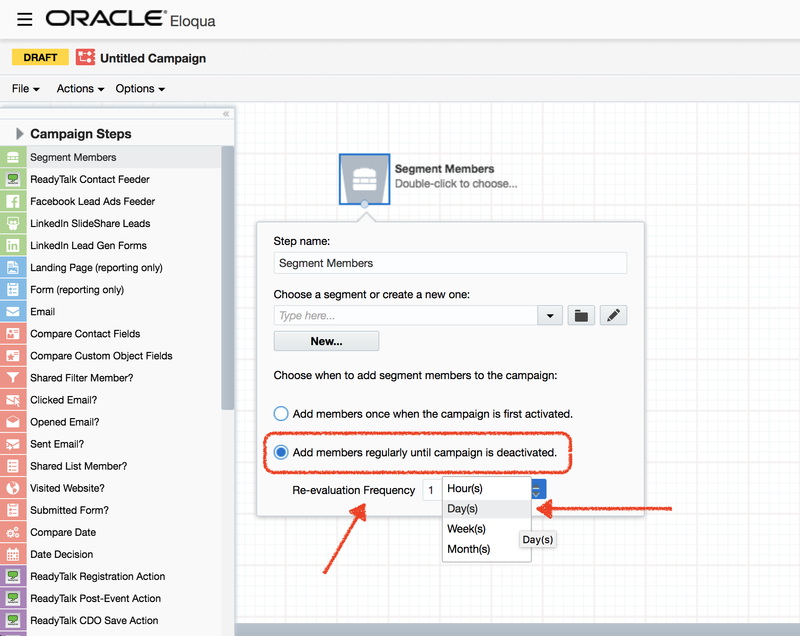 You can segment your data based on the Eloqua Contact having a CRM Lead ID and NOT a CRM Contact ID. The Segment screen shot below shows you one way you can identify leads from your CRM. NOTE: The example above references “SFDC” – Salesforce. However the construct of ID’s is reasonably universal across all CRM platforms e.g. Oracle Sales Cloud, NetSuite, Microsoft Dynamics etc. What’s the experience you want to deliver? The campaign canvas is where you design the experience you plan to deliver. Using the various elements of the campaign canvas, you map out the journey. You may have between 8 – 12 separate emails that make up your nurturing campaign. The first thing is to determine how the segment feeds into your campaign. As a nurturing campaign you will most likely want people entering the campaign on a regular basis, at least daily. Campaign member entry is critical. Campaign members may come from multiple Segments, this is easily accommodated on the Campaign Canvas. You can have multiple segments leading into the first email. This first email needs to be carefully written to ensure context around why they person has received the email. Use of Dynamic Content could assist with the personalisation or you may in fact have two first emails, one for each segment and then both groups channel into the remainder of the campaign. The first decision step to consider is the “Opened Email?” step. You have a range of decision steps to choose from. The idea is to increase the threshold of ‘engagement’ as your contact progressing through the campaign. The second and subsequent emails need to continue the conversation and be in context of the overall campaign. However, you can begin to raise the bar in the context of engagement. For example, after emails two or three, you could consider your threshold to “Clicked Email?“. If the contact hasn’t even opened the previous email, there’s merit in trying again. Keep in mind Eloqua will not send the same email to the same contact twice, so your repeat email “002B” needs to be a unique asset. Ideally it’s simply a “save-as” of email “002A” with the subject line modified and the time of delivery different to the first. The second thing you need to think about is how long between each engagement, the cadence of your campaign. Then you can deliver your message and determine how people progress based on their engagement, or their lack of engagement. How frequent should your emails be? This is another common question by new Eloqua users. The answer is not so simple, but at the same time it isn’t complex. You know your audience better than anyone and remember the way your audience interacts with your business, will likely be different to how they interact with other businesses. At a high level, B2B campaigns should allow 3-5 days between interactions and avoid emailing on Saturday or Sunday within the Australian & New Zealand markets. B2C campaigns could make these intervals much less, even down to the same day. It depends, are you selling handbags and shoes, or more high value considered products or services? Given a nurturing campaign will likely run for six to twelve months, it would be easy to ‘set and forget’. However, regular reviews of your campaign and specifically individual email performance is needed to ensure you optimise the campaign over time. You can reach the team at Marketing Cube here or via our social sites. You may also want to consider joining the Eloqua User Group, see the link below.